The ongoing involvement of the Regional South Orange Office with the Great Western Highway upgrade at Kelso continues to have positive results. The upgrade is managed by Burton Contractors Pty Ltd, who are working in close partnership with the Principal Inspector Jeremy Elms from the Orange Office. Jeremy recently provided a presentation to a group of Burton Contractors and RMS Senior Managers. • Issues faced with the identification of underground services, including possible locations of where unknown services run e.g. (gas and electricity). 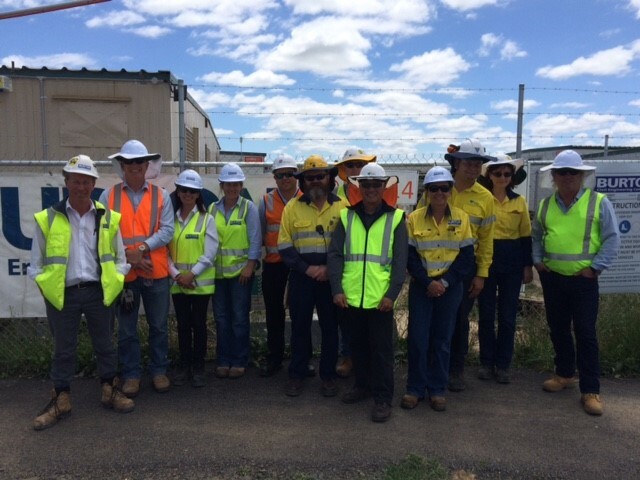 Pictured (L-R): Steven Green – Burton Business Manager Construction, Karl Wisdom – RMS WHS Partner Grafton, Helen Swan –Burton Safety Manager, Brooke Emmett – Burton Project Manager, Jeremy Elms –Safe Work NSW Principal Inspector, Craig Whiteman – RMS WHS Partner Parkes,David Langdon – RMS WHS Partner Sydney, Stephen Lum – RMS WHS Partner Wollongong, Natasha Stains – Burton Safety Coordinator, Mark DaSilva – RMS Manage rWHS Partnerships Infrastructure Development, Dorota Mears – RMS WHS Partner,Sydney, Brad Pigott – RMS WHS Partner Grafton.